There is no story without Gatlin — though there is not even one fact in the Telegraph's lengthy report to suggest he has committed any doping-related wrongdoing since 2006 -- so long ago that my youngest daughter, now a college freshman, was then in first grade. A story about Robert Wagner, a European-based track and field agent, would have comparably zero zing. But Gatlin? That he was in the Telegraph’s sights would seem clear from the get-go, from the headline and the very first paragraphs of the story. Now the question: why? And the corollary: to what effect? On Tuesday, the Telegraph doubled down, quoting British prime minister Theresa May as saying that she was “extremely concerned” and that athletes must "compete on a level playing field.” With this sort of reportage — the prime minister herself being asked in a day-after story to weigh in about a sprinter about whom the newspaper has not published one fact alleging current wrongdoing — and is it any wonder why the British crowds booed Gatlin so vociferously at the London world championships last August? Also Tuesday, the Telegraph suggested the FBI should get involved, quoting, among others, Damian Collins, the British chairman of the Culture, Media and Sport committee, saying a law enforcement investigation “could be the only way to crack doping in sport.” Back to American law basics for our British friends: sports doping is not a crime in the United States. This query: where were such comments when Dwain Chambers, who served a BALCO-related doping suspension, ran in the 100 meters for the British team, fourth in 10.05 seconds in one of the semifinals, at the 2012 London Olympics? Sure, officials there took legal action to try to stop Chambers from running, and lost — but who in British sports or politics sought to call out the FBI, as if, to "crack doping in sport"? Also perhaps to be studied: the laws of the state of Florida, the basis for jurisdiction should a lawsuit be contemplated against the Telegraph and its reporters. Further, according to The Reporters Committee for Freedom of the Press, 12 states require, under most circumstances, the consent of all parties to a videotaped conversation; one of those 12 is Florida. Did the reporters posing as film producers secure such consent? Big picture: fundamentally what would seem at issue is a tension between — to generalize — two different worldviews. On the one hand, there is the British take: once a cheat, always a cheat. Then there is the American story: redemption truly is possible, and a person really can pledge to be a clean athlete and live up to that ideal. There are, of course, exceptions to the British take, such as the Guardian's Sean Ingle, who has written of Chambers — this particular column was from the track and field world indoor championships in 2014 — words that apply equally and as forcefully now to Gatlin: "... he is not only a great sprinter, but a decent man." The point of Monday’s Telegraph story, obviously, was to create impact. 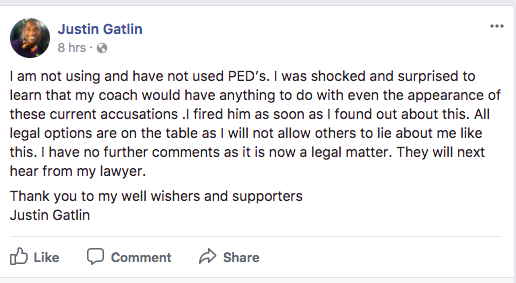 What has that impact been, for starters, on Gatlin’s reputation? That is: how have other outlets, and particularly in the United States, where Gatlin lives and trains, where he has neighbors and friends, understood the Telegraph report? As Gatlin said in a statement made public Tuesday, he has not used performance-enhancing drugs. Without proof to the contrary, any assertion that he has is — false. Meanwhile, the Telegraph story hinges on the notion that Wagner is Gatlin’s agent. Which he is not. Which if the Telegraph had done some elemental reporting would have been easily documented. Is this a case where it's worth asking that familiar question: why let the facts get in the way of the story? USA Track & Field requires agents to be "authorized." Such agents, with their athlete clients, are maintained on a list that is public record and easily accessible on the USATF website. Here, for the record, phones and email blacked out, are Robert Wagner’s details for his U.S. athletes. Justin Gatlin is not on that list. 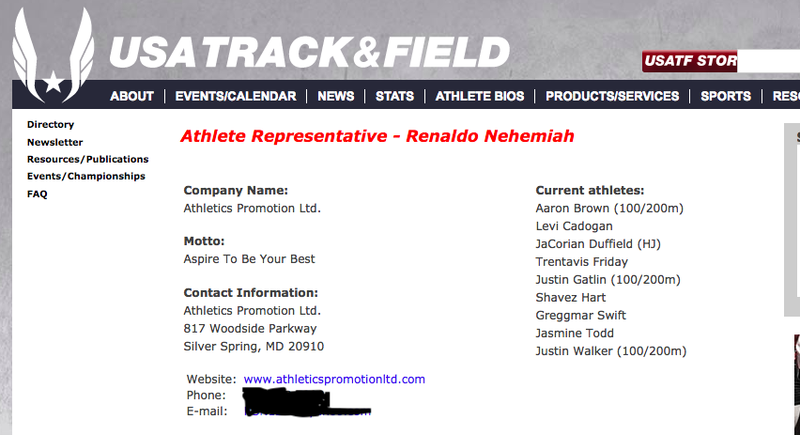 Here is who represents Gatlin: Renaldo Nehemiah. It would be keenly instructive, by the way, if in advance of publication of Monday's story the Telegraph acknowledged that it knew unequivocally who Gatlin's agent is, meaning Nehemiah. Since the editors of the paper would have wanted their reporters to have sought comment from the Gatlin camp in advance of the story seeing print, those reporters would have reached out, probably by email, to Gatlin's agent. Weren't any such messages almost surely addressed to Nehemiah? Wasn't Gatlin referred to therein as something like "your client"? Of course, Nehemiah and Wagner know each other. The track and field agent world is a small community. In that sense, Wagner has infrequently handled ancillary chores for some of Nehemiah’s athletes, and vice-versa: airport arrivals and departures, finding out lane line assignments, that sort of thing. Wagner has never been Gatlin’s agent. Nehemiah has been, since 2003. That’s the tipping point of this entire drama. On November 17, Wagner reached out to Nehemiah on Whats App, asking if he could call. Wagner was by then in Florida. Nehemiah was just about to head to his 40th high school reunion in New Jersey. On the call, Wagner said he needed some credibility for the purported movie project and for that purpose only sought to represent himself as Gatlin’s agent. You’ve got to be somebody in Hollywood, he said. For the purpose of this project, Nehemiah agreed, laughing, after talking it over with Gatlin, both believing they were helping a friend. What is the emphasis here? Is it these words: “...protect … myself”? Just so this part of the saga is clear — when the Telegraph reports that the AIU, the U.S. Anti-Doping Agency and the IAAF had “opened an investigation” into Gatlin, Wagner and Mitchell after “being made aware of the Telegraph investigation,” that’s because Wagner is the one who wrote the email. That being the case, wouldn’t it be fair to ask what the basis of any investigation would be? That “big talk” — no question it’s not a good look for track and field. And some of Mitchell's remarks — for someone who himself has a doping-related history, they're at best subject to differing interpretations. Does, for instance, anyone say, I’m going to buy illicit product x and give it to athlete y on day z? Where are the calendars and codes that were key to the BALCO matter? The details — the blood bags on hanger wires — that chillingly told the story of USADA’s ‘reasoned decision’ in the Lance Armstrong case? If the aim is to try to take out the world 100-meter champion, which Tuesday's follow-up Telegraph stories would seem to make clear, at least come with unassailable facts? Instead, isn't the internal conflict of Monday's Telegraph story right there for all to see? “The Telegraph began [its] investigation in July after being told that specific agents and trainers were involved in administering and supplying drugs to athletes and that the regulators had failed to take action. So from the start this was about Wagner? Yet the thrust of that lengthy Monday story is all about Gatlin? So who threw who not just under but into what bus? And why? To reiterate: what evidence — specific, discrete, hard facts — does the Telegraph have on Gatlin? Different questions: would the Telegraph have assigned five reporters to a story involving Wagner? Were those boos last August in London for Wagner — or Gatlin? From 2012 through 2016, Gatlin passed 72 USADA-supervised tests, according to the agency's "athlete test history" website; he has passed more in 2017. One can argue whether such tests prove anything. But that is the system that is in place, and because of his history Gatlin knows he is consistently under extra scrutiny. It's clear USADA has targeted Gatlin and other high-profile U.S. athletes, among them the swimmers Ryan Lochte and Katie Ledecky. In 2015, for instance, Gatlin passed 16 tests; Lochte passed 19 in both 2012 and 2013, Ledecky 19 in 2016, 15 so far in 2017. For nearly 10 years, Gatlin has made a very public point of being a stand-up guy, seeking to be an example of how it can be done clean. They teach us in journalism school to be skeptical of everyone and everything, and in elite sport there's ever the chance of something amiss. But this is a guy who had to work his way back from a four-year suspension during which, at maybe his lowest point, he — the 100-meter gold medalist at the 2004 Olympics — taught sprinting to 8-year-olds in Atlanta, just to make some money. Does it make logical sense that, having once had his station in life so reduced, he would now run the risk of trying to beat USADA or, for that matter, anyone in the testing game? On what basis would Wagner make such a representation? Particularly given that Wagner had not worked with Gatlin in any meaningful capacity and, indeed, had to call Nehemiah to secure permission for this one-off performance? There is no adverse analytical finding — doping jargon for "positive test" — of any sort. There is no evidence of any drug use by Gatlin or any athlete in Mitchell’s camp. What’s that third sentence? “Dennis Mitchell specifically told them that he and his athletes are not engaged in something like that.” For emphasis, in the story, Mitchell tells the reporters, "My athletes are clean." The picture of the syringe and the vial (purportedly a synthetic form of human growth hormone) that the Telegraph published in conjunction with the Monday story: there is zero context for that picture, no basis for where that syringe or vial came from, no explanation for who had either instrument or why, where or how. You can find a picture of a similar vial on the internet in just a few seconds. It's not hard to guess at the source of the photo but, without more, what was the point of publishing that picture? Simply to be salacious? Then there is the $250,000 fee. Again, go online. It's easy to find an anti-aging clinic in the Southern California suburbs where you can procure “testosterone replacement therapy,” upon exam, for $199.95 to $249.95 per month. Why $250k? Who was that for? Not Gatlin. Perhaps the same might be said about the paper’s?